William Cameron Menzies, Things to Come, 1936. In a special last-minute addition to AV Festival 10, Kenneth Anger personally introduced one of his favourite science fiction films. 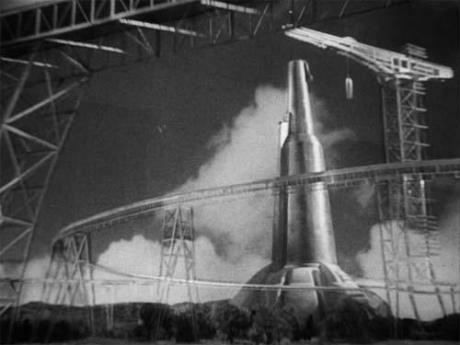 Things to Come (1936) is a British science fiction film produced by Alexander Korda and directed by William Cameron Menzies. The screenplay was written by H. G. Wells and is a loose adaptation of his own 1933 novel The Shape of Things to Come and his 1931 non-fiction work, The Work, Wealth and Happiness of Mankind. Things to Come sets out a future history from 1936 to 2036, set in the fictional British City of 'Everytown'. Kenneth Anger is an American underground experimental filmmaker, actor and author of two controversial Hollywood Babylon books. Working exclusively in short films, he has produced almost forty works since 1937, nine of which have been grouped together as the Magick Lantern Cycle, and form the basis of Anger's reputation as one of the most influential independent filmmakers in cinema history.